More than £5m is being spent in Cornwall conserving mine buildings and developing heritage trails. The project will link 13 villages in the Camborne, Redruth and St Day area with a mineral tramways route. The aim of the project is to open up Cornwall's central mining area to more local people and visitors. 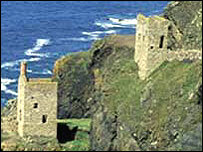 The area is an important part of Cornwall's bid to become a world heritage site. The EU's Objective One scheme is among backers of the project. It is also receiving National Lottery funding. Mine buildings dotted around the area will be conserved, shafts made safe, and a 17th Century mine leat and iron aqueduct will be among features preserved.